Dolores can offer expert advice on current Real Estate market conditions and property values. Her warm friendly spirit makes her a pleasure to work with. She will always go that extra mile for her clients and her superior negotiating skills have ensured the success of even the most complicated transactions. Another of her most valuable assets is her ability to insightfully understand her clients’ requirements and find homes that specifically suit their needs. After moving with her Airline Pilot husband and three children from Toronto in 1990, Dolores came to realize what life in Victoria could offer. Surrounded by the ocean with breathtaking views of snow capped mountains, voted “Best Temperate Climate Island in the World” by Conde Naste, Dolores saw that on a global scale, local property values were under priced. Entering the profession in 1999 she served her clients well, as the world discovered Victoria and Vancouver Island. Now, as an Award-Winning Realtor sought after for exclusive waterfront homes, view-properties, as well as private islands, and country acreages, she balances her professional life along with her role as a mother. Other interests include skiing, golfing, walking her dogs and entertaining family and friends at her private waterfront retreat. 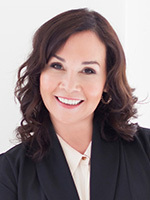 Above all, Dolores endeavors to provide the best possible professional care and attention for her clients.